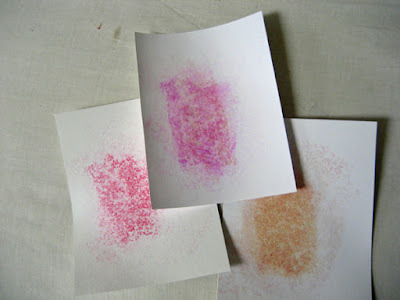 I have been admiring the watercolour backgrounds created by several artists on Splitcoast Stampers!! They are using products that I do not own so I was wanting to create a similar look using what I had. 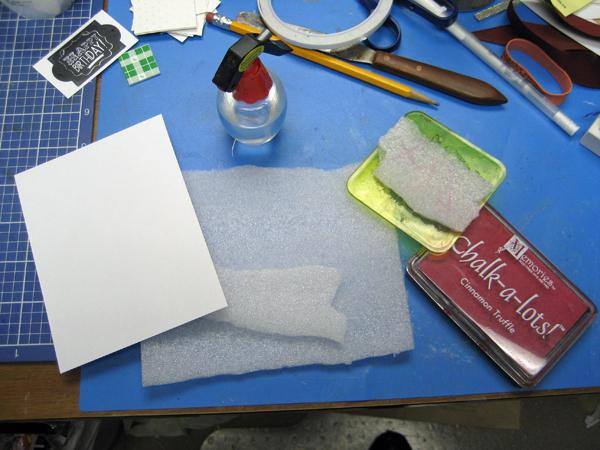 So I dug out some foam packaging, a mount, ink pads, some white cardstock and some water in a spray bottle. I tore a piece of the foam packaging so it would have rough edges and then used a palette knife to give it some texture by just digging it into the surface enough to compress the foam and mark it. That worked beautifully!! I adhered it my stamp mount and proceeded to play with it and some ink pads to see what I would get. To get a diffused look I needed a light spray water before stamping and then I just continued stamping in an all over manner without reinking! The chalk ink pad is the one on the lower right - much more yellow that I was expecting. Two different pink stamp pads for the other two. The one that worked the best was using a pink Distress ink pad and it was the right colour for the card I was making!! So I am happy to have "made" myself a fun background stamp and I will be playing with this idea for another while!! I hope you will all consider experimenting with your tools and supplies when following the inspiration of an online creation!! !